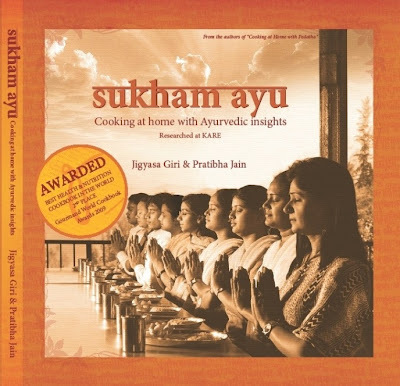 I participated in Siri's healing foods March event and had won Jigyasa and Pratibha's ayurvedic vegetarian cookbook "Sukham Ayu" in the lucky dip. I have read great reviews about the book but didn't own a copy until then. I was more than excited to get the copy in hand to get started with some Ayurvedic cooking at home. My thatha (paternal grandfather) who is a vegetarian convert strongly believes in Ayurvedic method of eating and every time my achi serves nutritious vegetarian food, he will start explaining the benefits of the ingredients used in it. Having listened to that from childhood, I had basic knowledge on the significance of that cooking. On a beautiful Thursday morning of April, I received the book. I opened the package and inhaled a lungful of its fresh smell. I touched the shiny pages and slowly flipped through it, admiring the beautiful food pictures and informative write ups. There are more than 60 vegetarian recipes under various categories ( from sweet to main course to salads). The first look of the book inspired me to get started with cooking right away and the book is definitely a gateway to understand the complex relationship between right food and good health. No wonder 'Sukham Ayu' won the second place as the Best health and Nutrition book in the world during 2009. 1. The recipes are simple day-to-day dishes. Most of us cook those dishes but after reading the book, we can decide how much quantity each one in the family can eat depending on their body type and also depending on the main ingredients. 2. There is a small column in each page which carries interesting facts about nutritional value/ recipe/ingredients and gives an idea on how to cook and serve them. 3. Beside simple and elegant language, I loved the colors used in the book. When I hold the book, I feel that the bright orange and red colors translates positive energy towards me. The book looks so vibrant and creates a mood to cook. On the whole , this book teaches home cooks about healthy eating and healthy living. My regular readers know that I have been on South Beach diet for quite some time and on the first day I started with it, I decided to stick to the recipes given in that book. And slowly as the days progressed, I started to make Indian dishes that were SBD friendly. This basic home style dal from Sukham Ayu book fits the SBD rules. So here I am sharing the recipe with you all. 1. Pressure cook the gram along with turmeric, fenugreek and onions in 1 1/2 cup water to a soft consistency. Churn well and set aside. 2. In a wok, heat ghee for tempering. Add the cumin seeds and as it crackles, add the asafoetida, curry leaves and chillies. 3. Reduce flame, add the cooked gram and salt. If you find the dal too thick for your liking, add 1/4 cup water. Allow to simmer for 5-6 minutes. Garnish with coriander leaves and switch off the flame. Serve fresh with whole wheat roti. I served it with white rice and carrot-capsicum curry and they were so good. 1. The phase 1 dieters can drink the dal as a soup. 2. For those in phase 2 and 3, dal can be eaten with whole wheat rotis or 1/2 cup white rice. Don't forget to participate in the summer drink giveaway. Click here to enter. Looks like a great book! Thanks for sharing the dal recipe. I have heard about this book too. very informative post. the dal looks lovely. Sounds like such an informative book. Very interesting. Your food looks fabulous!